As a fashion editor, one of the greatest perks is undoubtedly getting to attend fashion week. Our editors have the pleasure of going to the European fashion weeks from time to time, but it's New York Fashion Week that we regularly represent at. This season, our East Coast editors Nicole Eshaghpour, Lauren Eggertsen, and yours truly, along with our Los Angeles–based editor in chief, Kat Collings, spent the week viewing the F/W 19 collections at shows, presentations, and press previews. The designs were so good that we almost forgot about the ice storm outside (almost). Luckily, our home base, Hotel Hugo in Soho (follow it here), was very close to all the NYFW action. 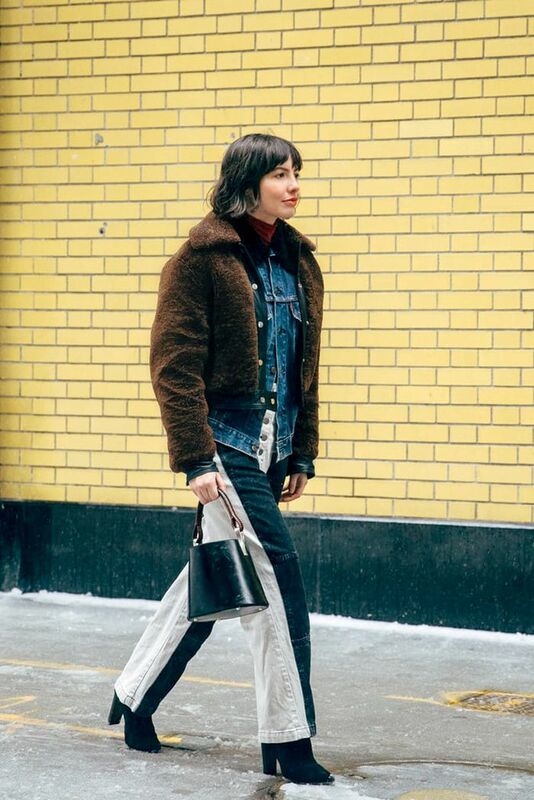 When you see fashion week street style, it's easy to think that everyone is just wearing head-to-toe statement pieces. While most show attendees certainly opt to wear eye-catching looks, the fact of the matter is that everyday basics play a big part in tying those looks together, and we editors wore plenty of them throughout the week (from head to toe). Keep scrolling to see some of our favorite fashion week outfits, and shop the everyday basics that we relied on. Next up, shop the only jeans our editors wear.